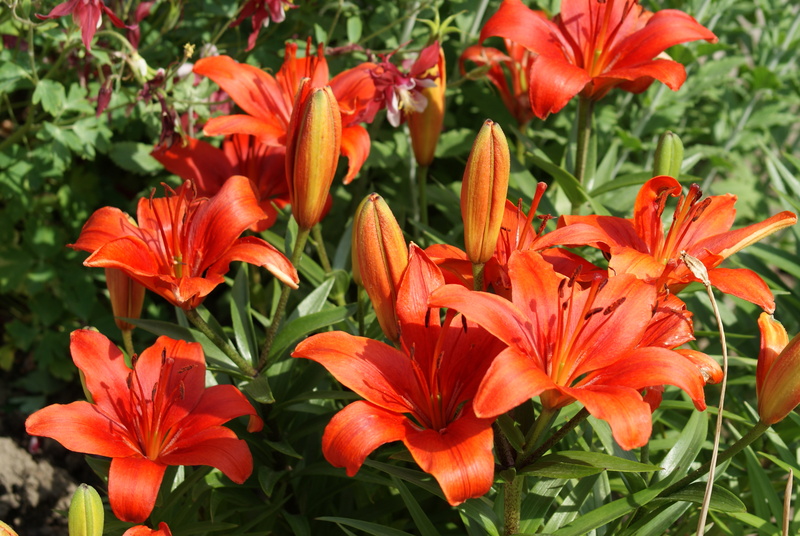 This orange garden variety is similar to the wild wood lily. The two verbs, to lie and to lay have different related meanings, although they are often used incorrectly, mostly because children are told never to lie. To lie, aside from meaning to tell an untruth (“He lied about…”), is an intransitive verb, which means that it never takes a direct object. This verb involves only the subject. I lie down. I laid down. I have lain down under the stars. Please, lie here on the blanket. To lay is a transitive verb and must have a direct object, although the object may be only understood, rather than stated. A direct object generally answers the question “What?”. That is, you have to lay something down. What did you lay down there? I lay the pen down. I laid it here. I have laid it down. Please lay the blanket on the grass. Most verbs may be used as both transitive and intransitive. That is why you need a certain self-discipline to distinguish between lie and lay. Most times it doesn’t matter to anyone, but other times it may. Create sentences using the verbs, to lie and to lay. Remember that you have to lay something down. Read the lists of L words and create a sentence for each. Make sure that you know the meaning of each word. The lady lay all the lemons in a line; only a little lime was lost. Did the lady lie about the lime? — From a children’s bedtime prayer, circa 1711.